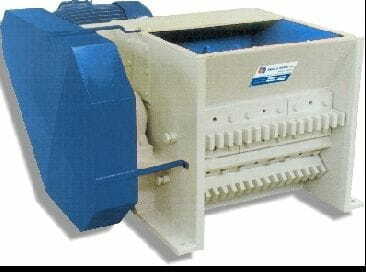 Crusher mills for waste meat an bones up to 25 T/h. The Bigas Alsina, S.A. fine particle crushing mill are made of thick carbonsteel plates, and it's composed of an internal roll, which is dynamically balanced and supported by two revolving radial bearings, which can be oriented by means of a double rim of barrel rolls and their housings of melted steel. On the roll there are some rotating knives, made of special material highly resistent to hits and wear, that when rotating, interpone among fixed hammers, which are thermically treated and, in case of servicing, can be easilly exchanged thanks to a grid-wedge system. An electric engine equipped with a pulley with self blocking compass, transmits the power to the control fly-wheel, which is made of thick plates, treated in order to allow the use of trapezoidal belts, to guarantee the maximum adherence.